This post is inspired by Pinterest and Google+. I love them both, but holey underpants, it can be just too much pressure for being perfect! My remedy? Slob for a day. You’re imperfect, I’m imperfect, the world is imperfect, and that is just perfect. I am an imperfect but passionate parent advisor, wanna-be-well-followed blogger, CEO of Emotional Fitness Training, author of no reknown, and internet addict, as well as a sometimes cranky old lady. Clearly, I have no where to go but up. That, however, is not my point. As I feed my internet addiction searching for added value to pass along to you, post after post tells me how to raise happy children who will not only be sought after by Harvard, but earn the Nobel prize before graduating from Harvard and laud their parents in their acceptance speech. Yuck. Bah. Humbug. I know while many messages are not that direct, many are. The most damaging only add to an already impossible to do list full of Musterbations – a word by Albert Ellis, master psychologist, describing the “Do more” messages. Some of the ones driving me crazy offer multiple tips: 10 tips for getting your child to love reading. 30 tips for teaching your toddler fine finger skills; 50 tips for making your teenager happy. Who has time to read all those tips, let alone put them into play? Nor does it help that most of the tips for destressing or getting happy or raising happy children only work some of the time for some of the people and never when you are least happy or most stressed. Finally, most of the social media sites promote fantasies of the perfect homes, the perfect recipes, the fantastic jewellery, the designer clothes on designer and perfect bodies. Grrrrrr. And probably, why we love it when the perfect appearing celeb turns out to be less than perfect. Constant in your face perfectionism, combined with an ever growing list of what you must do to find it, crushes us every day parents, and is not good for our children. It raises the bar far to high. Always asking or expecting more is a fallacious way other people try to whip us into shape. Back to raising the bar. Truth be told it does work, but only up to a point. And that point is too easily passed in our “Get Happy” ” Be All You Can Be World.” Moreover, creating dissatisfaction creates sales and as they say, money makes the world rotate. First parent tip: Know the enemy. That is the purpose of this post. 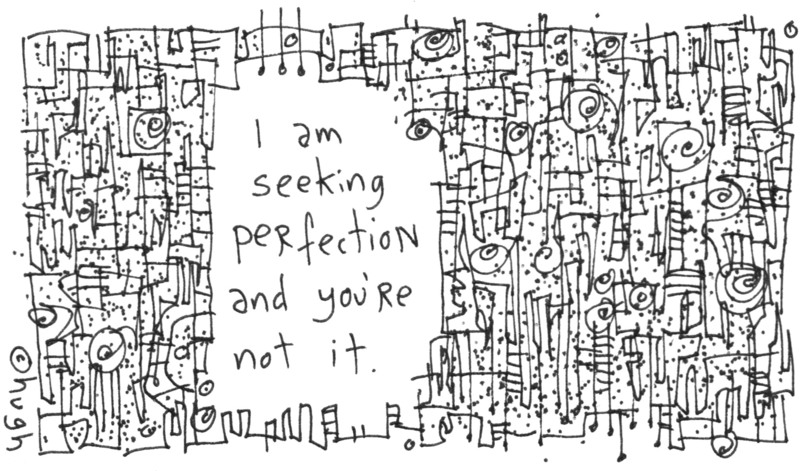 Expecting more and more, trying to do more and more, desperately seeking perfection does not work. Not only does it not work, defeats efforts to be all we can be. But mostly hurts too many of our children. Third parenting tip: Declare a slovenly day. If the weekend is coming, plan to spend it in your PJs. Don’ wear PJs? Then put on your oldest sweats. Don’t cook. Nosh on left overs or take your slovenly dressed self to the nearest fast food joint. And yes, you can comb your hair or cover it with an old hat. Slovenly hair and old sweats might get you arrested for vagrancy. No make up, however, if you are a woman. No shaving if a man. Let your children sloven it. Let them pick through the clothes hamper if they don’t want to stay in PJs. Only insist on clean hands before eating. Don’t constantly wash their faces. Now if you are the parents of teens, expect roars of outrage if you leave the house as a slovenly slob. Ignore them but do let them stay home or hit the road to a friend’s house. This is your slovenly day. Now I know that is probably asking a bit too much. But try at least some slovenly or slowed down mornings. And do practice occasional outings not dressed your best or letting your children’s clothes speak of rough play and real fun. Get comfortable lowering the bar a bit. You will profit, I guarantee. Thank you to the Daily Prompt for sparking this post and to Hugh Mcload for letting me use his Gapingvoid cartoon, although I may have perverted it. This entry was posted in Parenting Issues and tagged Emotional fitness, Emotional Fitness Training, good enough, Humor, Katherine Gordy Levine, Musterbation, parenting, Parenting advice, Parents Are People Too, Perfection, postaday. Bookmark the permalink.